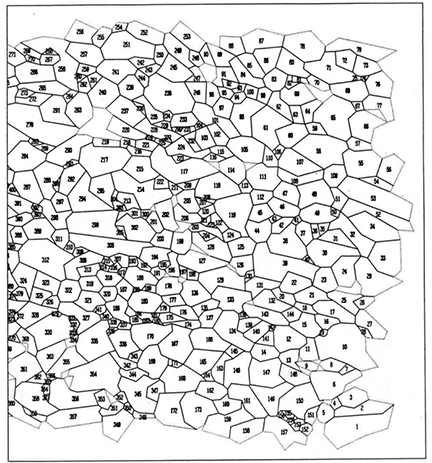 If my memory is functioning correctly, I believe Val Randle coined the term “meso-texture” to describe the texture associated with the misorientations at grain boundaries. I confess that, whenever I hear the term, I chuckle. This is because of a humorous memory tied to the first paper I was involved with. I was an undergraduate at Brigham Young University (BYU) at the time. The lead author, Brent Adams, later became my PhD advisor. The ideas presented in this work became the motivation behind my PhD work to automate EBSD. B. L. Adams, P. R. Morris, T. T. Wang, K. S. Willden and S. I. Wright (1987). “Description of orientation coherence in polycrystalline materials.” Acta Metallurgica 35: 2935-2946. The paper describes some impressive work on the mathematical side by Brent and Peter and painstaking work by Tong-Tsung Wang who did hundreds of manual orientation measurements from individual grains in several planar sections of aluminum tubing using selected area diffraction. My role was digitize the microstructures in such a way that the two-point orientation correlations could be computed. The following is an example of one section plane from this work. Digitized microstructure of one half of one section of a total of 10 sections used in the calculation of the orientation coherence function for aluminum tubing. Each grain number represents a individual grain orientation measurement. The experimental work was a major undertaking. Thus, Brent Adams was so interested to hear David Dingley’s talk on EBSD at ICOTOM 8 in Santa Fe in 1987 shortly after this paper was published. Brent envisioned a fully automated system to link crystallographic orientation with microstructure via EBSD. 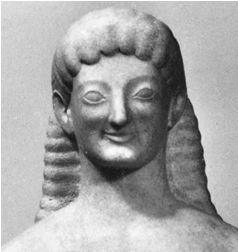 Greek statue who seems to be suppressing a chuckle. After this paper was published Brent received a letter from Sir Charles Frank. Sir Charles expressed his interest and appreciation for the ideas presented in the work. However, he objected to the term Meso-Structure. One of his objections was that “Meso” has its roots in Greek, but “Structure” is Latin. He didn’t like that we were mixing words of different etymological origins. I have to think this criticism was given “tongue in cheek” as the term microstructure with which Sir Charles was well familiar also mixes Greek and Latin. Thus, whenever I hear the term mesotexture used to describe grain boundary or misorientation texture I have to chuckle given it’s mix of the Greek “meso” and Latin “texture”. I’m not sure what the best term is to describe the preferred misorientation of grain boundaries. The community uses the terms misorientation, disorientation, orientation difference and others sometimes as synonyms and at other times with differences in meaning. As all aimless wanderin’s tend to leave crisscrossing tracks, I note that my first exposure to the use of Rodrigues Vectors, which lend themselves well to describing misorientation, was by Sir Charles Frank at ICOTOM 8 in Santa Fe. (Next in this series are some ruminations on the term “3D texture”).